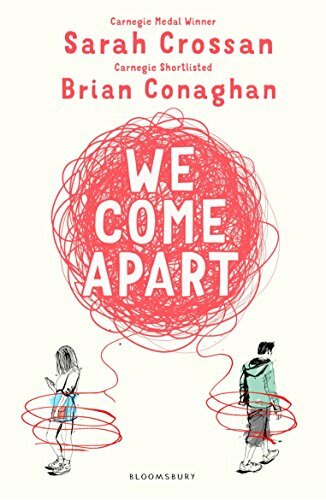 We come apart brings together two award winners, Carnegie’s Sarah Crossan and Costa’s Brian Conaghan, to share in telling the story of star-crossed almost lovers, Jess and Nicu. They each have their own problems. Nicu newly arrived from Romania with his parents, struggling with the language and money and unrealistic dreams. Jess with her mum’s new boyfriend, who not only beats her mum up but forces Jess to film him doing it. Nicu and Jess meet working in the park on a community service project following their separate arrests for shoplifting. Slowly, there and back at school, they get to know one another. The story is told in short poem chapters in the free verse form familiar from Crossan’s The Weight of Water and One, although here the drive of the narrative seems to allow less space for the almost self-contained, and often reflective, episodes of those novels; sometimes appearing more as cut up prose and dialogue. Each character takes it in turns to tell the story from their point of view. Nicu’s voice is particularly clever. He is mostly written as if just learning English idioms and often getting them wrong in a rather engaging and sometimes poetical kind of way. But his conversations in Romanian with his mother and father are in standard grammatical English. Collaboration between authors is unusual. You imagine it is easier with this format rather than with a prose novel. And it works seamlessly here. It is temptingly conventional to think that Conaghan might be responsible for Nicu’s voice and Crossan for Jess’s, although it could equally well be the other way round or an entirely shared responsibility. But, however the collaboration was done, it has worked brilliantly, with both characters having equal weight and being entirely believable, even if the themes of domestic violence, school bullying, immigrant baiting, and arranged marriage (this time it’s Nicu) are not unfamiliar in contemporary teen fiction.